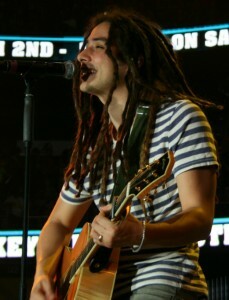 Jason Castro exploded on the music scene with American Idol in 2008 and a self titled album in 2010. Now Castro has a new album and is touring with the highly successful Christian music tour, Winter Jam, with some of the biggest Christian artists such as TobyMac, Red and Sidewalk Prophets. The Global Dispatch’s Brandon Jones spoke to Castro about Winter Jam 2013, making the new album and some of his fellow Christian artists. JASON CASTRO: Thanks for having me. BBJ: Well, let’s get right to Winter Jam. You are a little over a third of the way through the tour, tell me what the experience has been like. 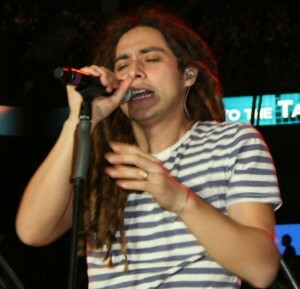 JASON CASTRO: It’s amazing as expected. Kinda cold weekend, but it’s fantastic. I’m sure the fans agree. I’m honored to be a part of it. BBJ: What the appeal of the different styles of music? CASTRO: I think that’s what I love the most about it, it’s so diverse. Red, Capital Kings and everything in between. (Jamie) Grace and her funky thing and then you end the night with TobyMac…awesome. BBJ: Your version of Leonard Cohen’s “Hallelujah” has been huge since your American Idol days, and you get to bring it to Winter Jam. CASTRO: Yeah, it comes at a critical point in the show. They asked if I’d like to play something during the offering, talked about what song and during the offering is a perfect song for it. It’s spiritual but not worship. So full of joy, one of my favorite songs and love that song. (I’m) glad to have the opportunity to do it. So far the reviews have been great. So happy to see what people are saying. I feel like I’m doing what I wanted to do, see where God takes us I’m just so thankful. BBJ: AllMusic‘s Matt Collar gave the album a three-and-a-half-out-of-five-stars, exclaiming that “Only a Mountain is a solid album that leaves you with the impression that Castro is more directly in command of his life, his career, and his music.” What are the words which describe where you are as an artist with this album? CASTRO: Freedom. Liberation. A great place to be. BBJ: Elaborate on how this creative process compared to the first album. CASTRO: It was college, five years ago and I was so new to everything. I had to trust others and not me. There’s a shift, I’m confident in writing and making this album. BBJ: Everything is different now, you’re married and that has to change things also. We first got married and my wife could travel, but now we had a daughter and things start changing. You have to find the balance touring to being at home. Winter Jam is great because it’s weekends and you’re home half of the week. BBJ: What prompted you to try out for American Idol? CASTRO: The love of music. I was playing drums, no singing and no guitar. I was in a serious band at 18. We were talking record labels and I was starting college. There was no time for school, all my time was in music. I was failing classes and I re-evaluated everything, not just music. This is nothing I ever imagined and it’s a testimony to God. BBJ: I guess we’ll have to wait to get you behind a drum set. CASTRO: Waiting for the right tour. One of these days. BBJ: What’s your favorite verse? CASTRO: In his heart a man plans his course, but the LORD determines his steps. (Proverbs 16:9) We have to let HIM lead your steps. He still does and I see things, look back and it makes sense. BBJ: What was it like being a Christian on American Idol? CASTRO: People were accepting. We weren’t too many believers on my season, but never felt any pressure. I could do my own thing. I wanted to do a David Crowder song on American Idol, but they told me the judges won’t recognize it. I sang Somewhere Over the Rainbow instead. BBJ: Any advice for the aspiring musician, maybe someone thinking about auditioning for Idol? CASTRO: Choose who you are everyday. BBJ: Wow, awesome. Thanks again. CASTRO: It was awesome, thanks.